THE Limerick Tattoo Convention drew record crowds last weekend with the event now firmly established on the annual calendar. The Great National South Court Hotel in Raheen was a hive of activity on Saturday and Sunday as hundreds of people travelled from Ireland and across the globe to attend second annual two-day convention. 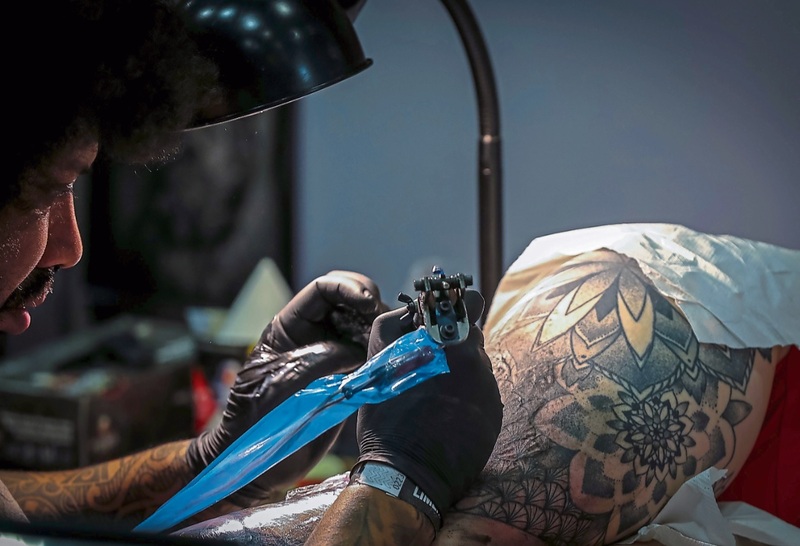 Around 100 tattoo artists from 25 countries attended the event including Luke Sayer, winner of E4’s Tattoo Artist of the Year; Ryan Ashley Malarkey, winner of US reality TV show Ink Master and Teresa Sharpe – one of the best known female tattoo artists in the world. One woman flew from the United States in order to secure an appointment with Ms Sharpe while Amy Fielding from Bristol travelled to get a tattoo done by Ryan Ashley Malarkey saying she was the “best person for the job”. Callum Walters, 18, from Kileely in the city said tattoos are the latest fashion accessory. He managed to get his latest tattoo by Luke Sayer who is from England’s Lake District. “It’s fantastic, we have had a lot of people who travelled from abroad, particularly the UK and mainland Europe, to get tattoos from some of the top artists in the world. They wouldn’t have a hope of getting an appointment with these tattoosists in the US or the UK,” said one of the organisers – Roy Keane of Soul Addiction Tattoo Studio, Roches Street. Tattoo artist Steve Savage, who runs Hard Knox Tattoo at Upper Gerald Griffin Street in the city said it was great to have a convention of such a scale in Limerick. Another local tattoo artist, Paul Bullman of Sands of Time, Shannon Street said tattoos of roses and pocket watches are in big demand at the moment. However, Anita Cosheril who lives in Tournafulla got two magpie tattoos to mark her 50th birthday. “Joy begins at 50. I find them (tattoos) quite relaxing believe it or not,” she told the Limerick Leader. LA-based tattoo model and Sullen TV Presenter Bernadette Macias was the show host throughout the weekend.